Gathered in this set of CD’s are all the RadioWAVE™ programs from 2011. There is so much to absorb in each show and often we hear from people who listen to them again and again. 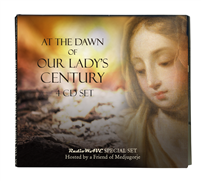 Special 4-CD set on the 100th anniversary of Fatima, and how it leads to what is happening in Medjugorje. Fasting from the heart is as deep, in that it brings prayer deeper still, because it comes forth more deeply from the heart. Fasting is a positive good for the family, a killer of strife, and a birthing of love. 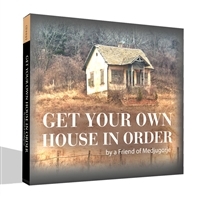 Special 4-CD set, with a Friend of Medjugorje, December 2018, in which he shares a new revelation about the messages, as well as a never before released message given to him by Our Lady through Marija. What is Our Lady accomplishing in the world? A Friend of Medjugorje tells of this and of some remarkable new insights that have never before been mentioned. A must-listen! What causes wars in the world? The answer is closer than you think. Includes a bonus track, "A Story of Two Blessings." What is the fatal mistake that the enemies of God and the church are making? A Friend of Medjugorje answers this and covers a whole lot more in today’s broadcast. Our Lady has come to Medjugorje because there is a lapse in direction for the world. People are starving and Our Lady has come to feed us. A Friend of Medjugorje tells of how Our Lady will come into your life if you desire it, and the miracles She will work for you. A must-listen to prepare for Christmas! 2-Hour Special: A Friend of Medjugorje tells of the devil, those who belong to him, and reveals an incredible prophecy, never before released in the world. A Medjugorje prophecy revealed. A must-listen! All Radio WAVE & Mejanomics shows for this month on 6 CD's. All Radio WAVE & Mejanomics shows on 6 CD's each month. Should We Vote or Should We Not Vote? A Radio Wave Special with A Friend of Medjugorje. The Look What Happened While You Were Sleeping 5-Part Series As Heard on Radio WAVE. Who is they? A Friend of Medjugorje answers this and more in this show. A Friend of Medjugorje answers this question and also tells of the 4 things necessary to be an apostle. A Friend of Medjugorje challenges the status quo of what the world views as heroes, who they view as heroes, and how this is infecting even the church - and how many are duped into believing in the wrong heroes. A show for helping to discern truth. Live from Medjugorje, a Friend of Medjugorje tells of relevant and real-time world events that Our Lady speaks of, uncovered in a remarkable way. Be prepared to be challenged and moved in your walk of conversion. A Friend of Medjugorje discusses many issues in todays society using the template of Our Lady's Messages.